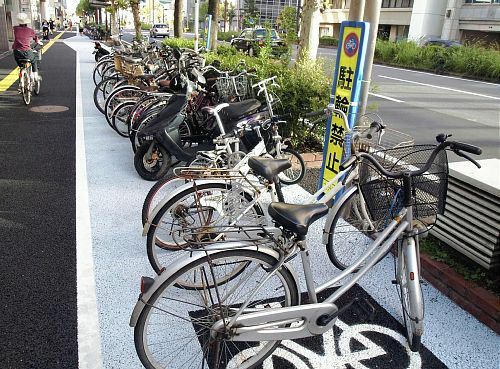 Oita residents want bicycle parking, not bicycle lanes. Today I discovered a wonderful story of residents in Oita using a newly developed bicycle lane as bicycle parking. Bicycles parked in a bicycle lane, Oita, Japan. Initially I was amused, "Look at those wacky Japanese mistaking a bicycle lane for bicycle parking." and had a chuckle to myself, but upon reflection I realized that by parking in the bicycle lane these residents are sending a strong message to their city, and that message is "We don't need bicycle lanes, we need bicycle parking." Urban planners obviously did not consult residents before foisting this unneeded infrastructure upon them. Fortunately residents have taken it upon themselves to use the new infrastructure in a way that brings the most benefit to them. Power to the people! They do have a point. Just as much as car drivers, people riding mountain bikes, kid bikes, and dutchie bikes among others deserve a place to properly park. In other countries, it's the other way around , it's more of "I hate cyclists and their lanes. I'd want to keep every inch of the road for cars and other vehicles". Geez. I'd really want to see pedal bikes and other motorized bikes such as the razor ground force drifter to take a bigger chunk of the streets. they just didn't understand at the time. The bike lanes in Oita are open now.